In the common part (S1-S2), students will acquire a state-of-the-art knowledge of advanced Biomolecular and Cellular Biology disciplines. Specific courses are Advanced Cellular Biology and Biotechnology, Advanced Molecular Biology, Cell Physiology, Bioinformatics, Molecular Pharmacology. Protein structure, proteomics, biophysics, transcriptomics, bioinformatics and systems biology. Human anatomy, immunopathology, and oncology, medical and cancer genetics with particular respect to cellular and molecular mechanisms of diseases. Human and comparative neuromorphology, cellular neurobiology, molecular and developmental neurobiology. Students will also acquire a state-of-the-art knowledge in advanced experimental methodologies provided both by theoretical and practical courses and by preparation of the experimental thesis work (S4 - 39 credits) that will produce a Dissertation, as an essential achievement of the CMB program. Together, these activities will provide a good grasp of the scientific method of investigation, sufficient to allow to work independently and to participate in the design and execution of experiments, as well as in the interpretation and presentation of data. The Master Degree in Cellular and Molecular Biology is part of the NENS (Network of European Neuroscience Schools). What about my skills after getting my Degree? The objective of the Master Degree in Cellular and Molecular Biology (CMB) is to provide a deep and integrated knowledge of the biological systems from the cellular and molecular levels to complex organisms, together with the ability to use such knowledge in specific areas of applied biology such as biotechnology, biomedicine, and neurosciences. human or comparative neuroanatomy, cell, molecular and developmental neurobiology, neuropathology. Remarkable skills in advanced, innovative and experimental methodologies will be provided by courses of the specific curricula as well as by the expertise acquired during the preparation of the experimental thesis. This latter can be developed both in Italy or abroad, in the frame of internationalization activities and student mobility programs (Erasmus). On the whole, all the activities described above will provide a good command of the scientific methodology, conferring a good level of autonomy in the design and execution of scientific experiments as well as in data presentation and discussion. Some courses dedicate time to the discussion of bioethical issues and social impact of the methodology described. All the activities reported above proved graduates in Cellular and Molecular Biology with skills to read and critically discuss scientific papers pertaining to specific topics, allowing a correct interpretation and use of the relevant information, taking advantage of an appropriate scientific language. enrol in Specialty Medical Schools opened to LM-6 graduates. The Ph.D. is the natural educational prosecution for people interested in research, while the Specialty Medical School Degree is necessary to enter upon the manager career in the Social Security Service. The Biologist works in public or private Research Institutes, enterprises, and industries, in several fields: biomedicine, molecular biology and biotechnology, genetics, environment, water, air, soil and food hygiene, physical chemistry, biochemistry, microbiology, toxicology, pharmacology and in quality control procedures. To work as a Biologist, either as a freelance or as an employee in Corporations, graduates in Cellular and Molecular Biology must be enrolled in the 'A' section of the Biologist National Register, accessible only upon getting through the State Exam. The Specialty School Degree, obtained by attending one of the Specialty Medical Schools opened to LM-6 graduates, is mandatory to work in the Social Security System. As previously reported, the Biologist works in extremely different contexts and several types of institutions (public and private companies, Universities, Research Centers, schools). Some Biologists carry out field activities in natural environments, while others mainly work in laboratories. In every field, since he/she participates in complex experiments, the Biologist is frequently engaged in group work, where he/she manages with other professionals. In the environmental milieu, in particular, the Biologists frequently interact with Naturalists, Geologists, and Chemists, while in the biomedical milieu he/she frequently interacts with Medical Doctors and other Medical professionals. Moreover, the recent development of the so-called '-omic' techniques (genomic, transcriptomic, proteomic, etc. ), and the consequent need to manage and elaborate huge amounts of data put Biologists in close contact with Bioinformatics. Who will take advantage of my work? As frequently witnessed by the press, Biology investigates topics of general interest, such as the effects of changes of the natural environment on both animal and plant life, the effects of genetically modified organisms, the human genome and microbiome characteristics and functions, food-related risks. The results of the research carried on by Biologists can markedly contribute to human health improvement, to community welfare as well as to natural environment preservation and improvement. 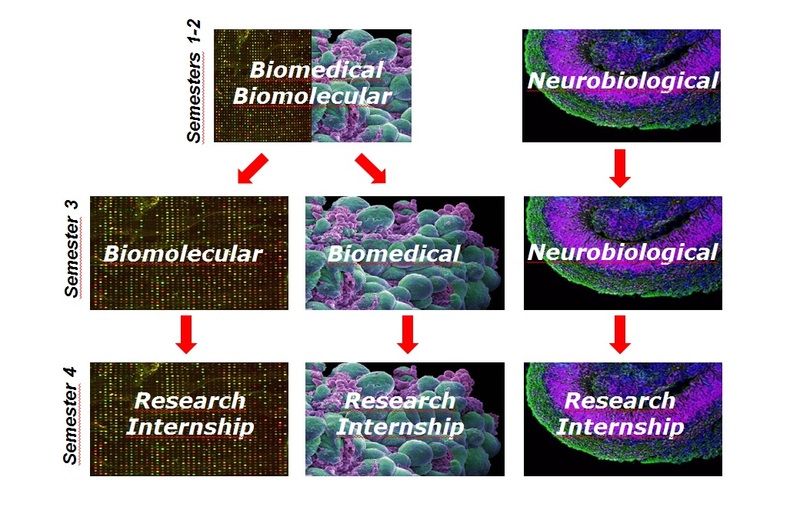 As an example, the comprehension of the pathogenetic mechanisms and micro-organism role, the development of new vaccines, antibiotics, and other drugs are among the translational activities carried out by graduates in Cellular and Molecular Biology. On the other side, human activities in the modern age have markedly affected the environment, and at present, the biological knowledge is fundamental to cope with a sustainable development. For this reason, Biologists will be crucial to provide cues in order to shape decision-making at different levels (government, industry, commerce, education), as well as the public opinion. Indeed, consciously facing social, health, legal and ethical challenges posed by the new technologies is the only way to reconcile development, justice, and life on the Earth.